This is the best homemade Ubtan for fairness of complexion. It will definitely work on your skin and lighten your colour 2 to 3 tones with in 2 weeks. Grind Orange Peel and Almond to powder, now add Sandal Wood (Chandan) Powder, Chickpeas Powder (Basan), Cinnamon Powder and put them in a jar. Take 1 Tbsp of this dry powder in a bowl and make a paste by adding Yogurt and Cucumber Juice and Lemon Juice in it. Now apply this paste and leave it to dry. 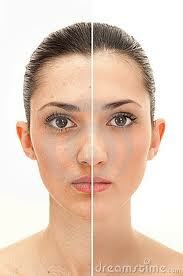 When it is dry spry rose water on face and moisten it and then gently rub it to remove but don't pull your skin. Now wash your face with eater do not use any soap or face wash. Moisturise your face before going to bed. It's just like some of the thousands and thousands of people who do plastic surgery to have breast implants or facial restructures they want to look the way they want to and if its’ what makes them happy I am happy for them as well.